Flexibits' Fantastical, a menubar-based calendar application to quickly enter new events with natural language recognition, has today been updated to include native integration with Reminders, a feature that Apple rolled out with its own app in iOS 5 last year. I have been testing the new Fantastical (version 1.3) for the past weeks, and its integration with calendars, reminders, and natural language input is as solid as ever. One of Fantastical's biggest advantages over similar apps to quickly add items to synced calendars is its built-in CalDAV engine, which ensures the app can directly communicate with online calendars without having to leave iCal open in the background. As with events, Fantastical 1.3 lets you create reminders with a few keystrokes, using reminder lists already configured in your calendar app of choice, such as iCal or Outlook. Because Fantastical is capable of directly communicating with the syncing engine behind Reminders -- not just the calendar application that displays them on the desktop -- you'll be able to add reminders in Fantastical and have them synced across devices without leaving iCal open. 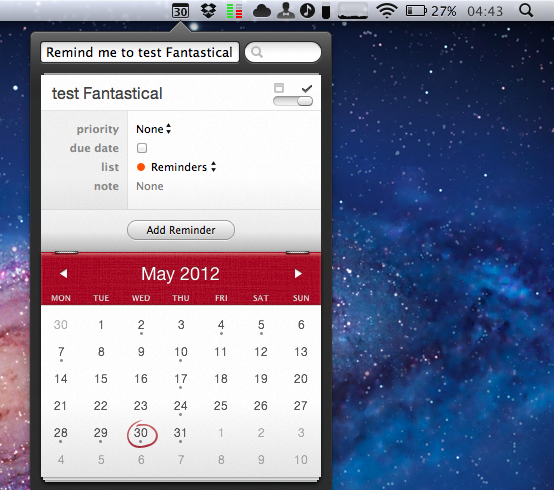 In my tests, Fantastical 1.3 indeed took reminders I added from the menubar, and synced them to iCloud.com and other iOS devices within seconds. If iCal opens, as Flexibits explains in the FAQ, it's because of a Lion default setting related to push; switching iCal's refresh rate to 30 minutes doesn't compromise Fantastical's ability to create events and reminders independently of iCal. 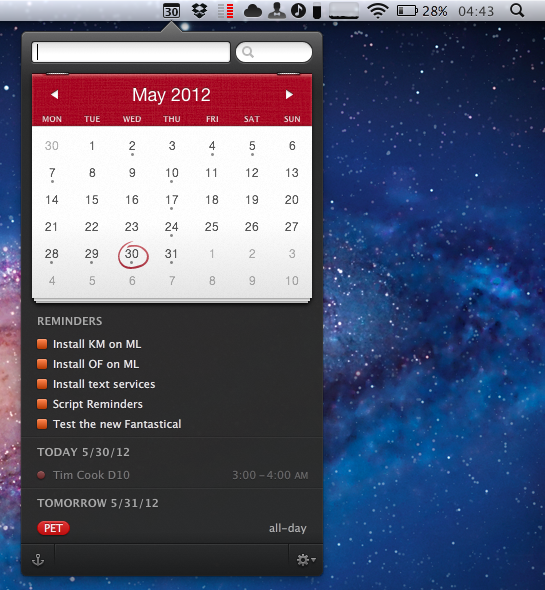 Fantastical can create, edit, and delete reminders with natural language recognition. In testing the app, I told Fantastical to "remind me to take out the trash", and the app intelligently parsed the command as just "take out the trash", interpreting the initial portion of the sentence as a reminder input. Similarly, commands like "remind" and "todo" will trigger reminder creation in Fantastical 1.3, which, generally speaking, tries to associate every new item without a date to a reminder list. This, however, can be reverted at any time, as the interface to switch between reminders and events includes a handy switch to jump through both options. Reminders can be given a specific date or priority, assigned a note, but they don't support location and time-based alerts, as those features are exclusive to iOS's Reminders and Siri. In the app's UI, reminders are displayed alongside calendar events, and they use the same floating popover windows for modifications. In testing Fantastical 1.3 with my iCloud calendar and reminders, I found the app to be remarkably fast and reliable. As you would expect from Fantastical, adding new reminders takes seconds thanks to keyboard navigation and shortcuts, and the syncing engine didn't miss a beat when communicating with iCloud and iOS. Unsurprisingly considering previous versions of the app, the parser doesn't disappoint when it comes to automatically switching between event and reminder creation (try to add a date to a reminder, and check out the animation). Fantastical 1.3 is a great update if you've been looking forward to Reminders integration, and another solid release for an app we've previously recommended. Fantastical is $19.99 on the App Store.